Credit: Spike TVBeyonce has a knack for surprising people, like dropping an album on us without warning. Or popping up without warning during Channing Tatum‘s performance of Spike TV’s Lip Sync Battle. The actor, dressed in a blonde wig, black bra and gold choker, was delivering his rendition of Beyonce’s “Run the World (Girls)” during Thursday night’s season two premiere when the Queen Bey strutted onto the stage to join him for the final few seconds. Afterward they laughed and embraced, with Tatum imitating Beyonce’s trademark hair-shaking move. Hosts LL Cool J and Chrissy Teigen also could barely contain their excitement. Neither could Tatum’s wife, Jenna Dewan-Tatum, who was going head-to-head against her husband in the competition and who fell to the floor in disbelief when Beyonce emerged from backstage. 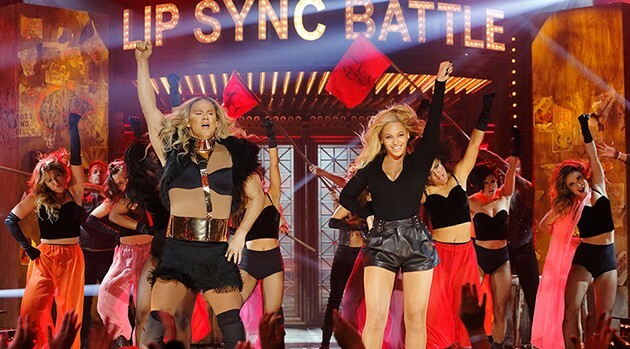 If you missed it, you can watch the full Lip Sync Battle episode now on Spike.com.